There's one product in my makeup arsenal that's a constant. Whether I have time to do a full face of makeup or I (gasp!) run out the door with a clean face, this one item never leaves my side. It's in my bathroom, on my desk at work, in my purse, on my kitchen counter, in my makeup bag, on my nightstand. What is this magical product of which I speak? 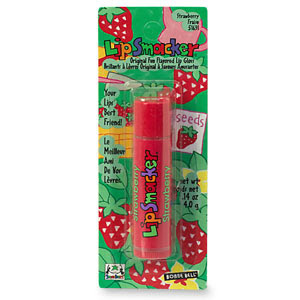 Why, it's none other than Bonne Bell LipSmackers -- yes, the lip balm we all carried around as kids in fun flavors like Dr. Pepper and Root Beer! These balms seriously moisturize and soften my lips like no other, keeping them so supple and smooth even during the harshest of temperatures. Now, you may ask how I can afford to have them strewn around so many different places and not go broke. Well, that's where Wallet-Friendly Wednesdays comes in -- because each LipSmacker is available for only $1.60! And if you just have to go for the massive Biggy LipSmacker, it will only set you back a whopping $2.95. I could buy every single color and flavor and still be spending under $75! Here are the ones I just can't live without. Bubble Gum: The Bubble Yum-like flavor just makes me hearken right back to my childhood. Pink Lemonade: This flavor makes me long for those hot summer days when I can just kick back with a tall glass of -- you guessed it -- pink lemonade! Plus the soft pink leaves such a nice sheen on your lips. Strawberry: The subtle crimson shade is super-flattering, and out of all the flavors this one is definitely my favorite. Watermelon: Get the great taste of the juicy summer fruit without having to spit out any of those annoying seeds. These flavors, plus many more, are available at drugstore.com. Be sure to pick up one -- or twenty -- today! Fun post, I love these. they are so fun and yes so cheap. I have to try the cheery 7up one of these days. The pink lemonade is my fav. and I want one of those biggie ones. haven't actually bought on yet, but I look. Aww these really bring me back!! Who could forget Dr. Pepper lip smackers???? Great post! Totally takes me back to 8th grade. Bubble gum and strawberry were my favs then and still are today. I buy them for my 12 year old niece and she's hooked now. 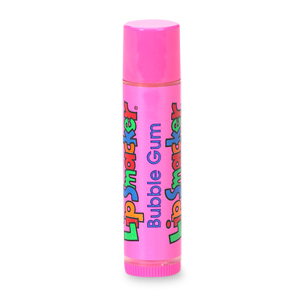 beauty alchemist -- the biggy lip smackers are awesome! I have two of them, they last forever and the staying power is amazing! nilla cookie -- I know, Dr. Pepper was what I wore all through junior high! I remember these from elementary school! Most of my friends liked Dr. Pepper, but I was always partial to Pink Lemonade! Great post! I love Dr. Pepper, I have used it forever. I also love the Kiwi Strawberry - yummy. I'm with you on this! My watermelon smacker is in my bag, my strawberry smacker is in my train case, and my cotton candy smacker is perched near the kitchen sink! These keep lips soft, prevent chapping in the winter, and remind me of my childhood! LOVE them! Bubblegum is my all time fave. Don't you just love when something so cheap works so well?